﻿ Yacon Syrup Review: Is it Safe? In the search for a weight loss ingredient supplements companies have started to now use Yacon Syrup. It is a sweetener which is taken from the roots of the yacon plant. In one study it was reported to potentially lead to less weight, lower waist size and even a lower BMI. However one study is not enough to fully understand the potentials for an ingredient. This reviews only purpose is to help you understand how this ingredient ranks against all the other weight loss products which exist out there.. The idea behind Yacon Syrup is to give off sweetness which is roughly about 30% to 50% of the sweetness one can expect from regular table sugar. Because it is a low calorie sweetener substitute, some people have began using it in place of table sugar. In the gut this sweetener is supposed to promote healthy gut bacteria which is good for improving bone health. However this has only been seen in mice. Another claim you might hear is that this sweetener is slowly processed in the body, which means you can expect a bit of help with hunger. Still this effect is minor and has yet to show a real effect on producing weight loss results now. Foundhere is all the possible alternatives made to help you lose weight effectively. As a sugar substitute it does have less calories than regular sugar. It also does not raise blood sugar levels like table sugar would. One thing you may not know about Yacon Syrup is that it has an incredibly limited amount of studies performed. Even the studies performed have shown to be effective only in helping mice, not humans. Also some humans may actually be allergic to this ingredient. Meanwhile teas containing this ingredient have shown a potential for damaging kidneys. It is often advised to avoid this ingredient due to these potential threats. Well since the information provided about this ingredient is very limited, it still is up in the air whether or not one can expect reliable results. So far though with so many mixed outcomes you might not want to be Yacon Syrups test subject. Still one might find this low calorie sugar substitute helpful even with the potential risk factors. 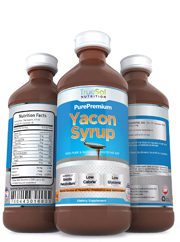 Measure how well Yacon Syrup does against all the other options for weight loss. Well even though there are many different brand's using this ingredient, one quick search makes it easy to see that the evidence is clearly missing. There are so very few human studies and all the touted positives still have a giant question mark next to them. To gain effects in weight loss you now have the ability to look at the very best weight loss options.